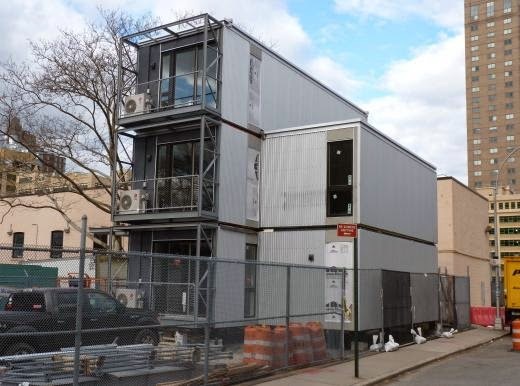 New York City is testing an experimental post-disaster housing prototype in Downtown Brooklyn. 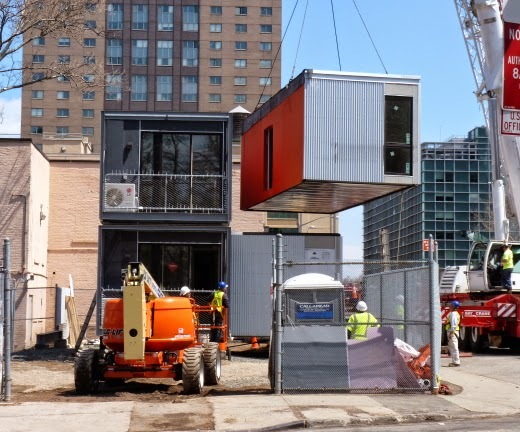 If the test is successful, the modular housing could be installed in parking lots, on dead end streets, or on other paved land in neighborhoods hit by a disaster. The idea is to keep residents living as close to home as possible while they recover. On Saturday, a crew stacked five steel units on top of each other, Lego style, in an empty lot on Cadman Plaza East. By mid-afternoon, the four-bedroom, three story “townhouse” was fully assembled. The NYC Office of Emergency Management (OEM) has been working on the project for six years, along with the city’s Department of Design and Construction (DDC), FEMA and the Army Corps of Engineers.